On a mission to spread happiness through Dhansak and other Parsi delicacies, Perzen Patel is the Bawi Bride. Dar Ni Pori is quite similar to the Maharashtrian puran poli. While most Indians take their dessert seriously, Parsis take this one step further. There was Uncle B, my childhood neighbour from Pune who lived alone, but used to hide his Ferrorocher in his Godrej safe along with his valuables so that the maid didn’t surreptitiously steal them! And then there was Aunty J, who always said no to an extra spoonful of rice (carbs dikra, you see) but never to another bowl ofRavo. At the ‘BawiSasural’ too, we take our sweets seriously. There’s always some Chapat – a kind of Parsi crepe – or Bhakra to go with tea and at night, dessert is a three-course affair featuring chocolates, pudding or cake and generous handfuls of dry fruits. All this mithu monu has meant that over the course of my three-year marriage to ‘BawaGroom’, I’ve tried a bunch of Parsi desserts too and gone beyond the Lagan Nu Custard (custard made for weddings) and our Caramel Custard that everyone talks about. So, if you’ve had your fill of custard, and would like to try some of our more rare sweet treats, then here are 5 totally worth trying. Ravo: Quite similar to sheera, Ravo is the staple sweet dish eaten for all happy occasions in a Parsi household. But, instead of water it is made with milk and generous servings of dry fruits and ghee. While almost everyone can make a decent Ravo, the trick is to get the texture correct. Having a dinner party? Jazz up this comfort food by serving it in wine glasses from Eva Solo or shot glasses! Generous amount of ghee and dry fruits go into making Ravo. 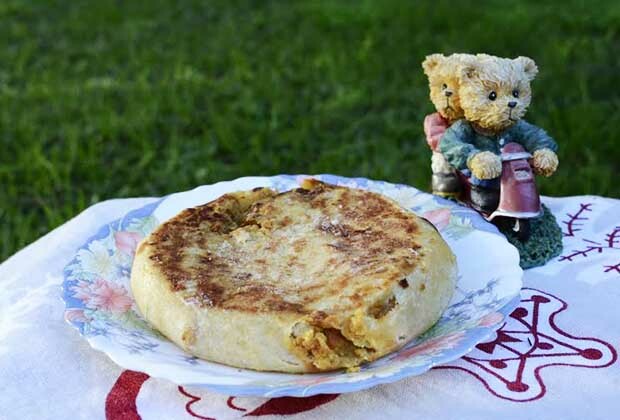 Dar Ni Pori: While everyone knows about the puranpoli, few know about the Parsi Dar Ni Pori. The similarity between these dishes ends at the use of lentils. Had mainly as tea-time snack, you could go so far as to say that the Dar Ni Pori is the Parsi equivalent to the British scone. Trust me, nothing can beat the feeling of crisp, flaky pastry giving way to a thick layer of sweetened dal that’s mixed in with a variety of dry fruits. Sadly the Dar Ni Pori can be quite complicated to make and so is hard to find. Your best bet is to find an old Parsi aunty, who supplies them or head to PAC or RTI in Mumbai. Mithoo Dahi: There’s nothing like ending a meal or beginning one with something sweet, and that is the sole purpose of the Parsi Mithoo Dahi. Made with rich buffalo milk, this yoghurt is liberally sprinkled with sugar and is set into miniature cups. The dahi is then served alongside another sweet dish like sev (vermicelli) to take your dessert to another level. While you can easily make it at home, my favourite place to have Mithoo Dahi is from PAC in Nana Chowk or Parsi Dairy Farm at Marine Lines. Dudh no Puff: Of all these desserts, the Dudh no Puff has to be my favourite. Simply put, the Dudh no Puff is chilled milk froth or what some international cafes call a fluffy. In terms of flavour, it comes quite close to Delhi’s Daulat Ki Chaat. However, the Parsi version also has a delicious undertone of cardamom and nutmeg, and has achieved cult status due to the fact that it is now most hard to lay your hands on. While some colonies in Mumbai will have a local vendor selling puffs early in the morning, your best bet is to go to Udvada during the winter months or stop at Parsi da Dhaba on the Mumbai–Gujarat Highway. 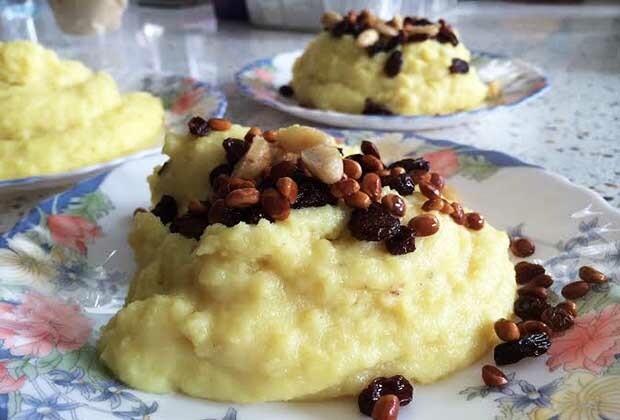 Give your regular Laganu Nu Custard a quirky twist. Lagan Nu Custard ice-cream: I have to admit this is not some secret heritage dish lost to the times, but it is something I came up with – a happy accident of sorts! 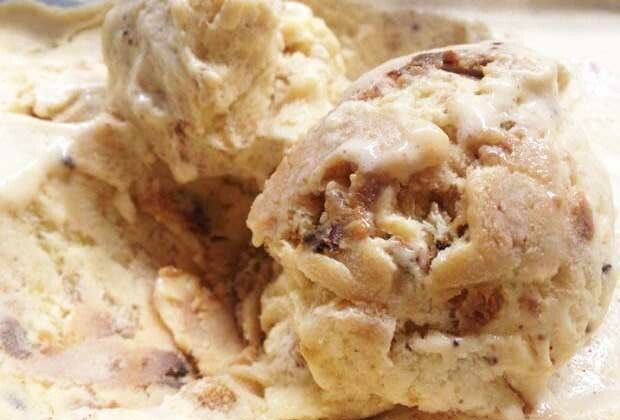 To put it simply, this ice-cream is made with chunks of Lagan Nu Custard frozen between a creamy vanilla and nutmeg base. While you can of course have it by itself, it tastes even better with a shot of Bailey’s or a side serving of some more custard! Want to give this ice-cream a try? Here’s how you can make it at home. So the next time you’re at the iconic Britannia & Company Restaurant at Fort or craving some Parsi desserts, skip the custards and give one of these desserts a whirl. Have you had any of these before? Where’s the best place to eat them according to you? Leave us a comment and let us know.